Close to Tom Tipton’s devotion to his family and to his faith, come his deep love of his country and the freedoms it proclaims. This is true despite the fact that, as a black youth, growing up in our nation’s capitol, which was still a Southern city, Tom was often denied freedoms that whites took for granted. As a young shoeshine boy, he buffed the boots of some of Washington’s most prominent politicians in the shadow of the White House. Yet he was not permitted to participate in the annual White House Easter egg hunts because of the color of his skin. In the 1960s, he stood with Martin Luther King, Jr. in various rallies fighting for the freedoms his people were denied. Decades later, he was invited to perform at the White House he was denied entrance to as a youth as a guest of President Bill Clinton. He sang at various occasions for presidents Jimmy Carter, Ronald Reagan and George Bush Sr., for vice presidents Hubert Humphrey and Walter Mondale and Senator Hillary Clinton. Tom served for 29 years as a soloist at Reverend Robert H. Schuler’s internationally famous Crystal Cathedral and performed more than 100 times on their nationally broadcast TV “Hour of Power”. 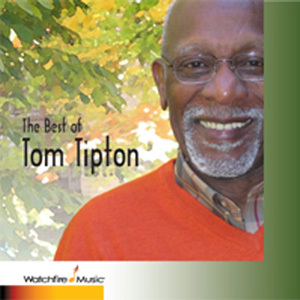 Here, you can listen to a wonderful track, “Let My People Go” from The Best of Tom Tipton – a spotlight on nearly four decades of song. Herein lies an American songbook of classic spirituals and sacred songs. Taken from the best of 12 albums of recorded music, this is the retrospective of a great life in music — the life of Tom Tipton!